Foodies, take note: this weekend (November 14-16) is the Great American Cooking Expo, "Chicago's Premier Food, Drink and Culinary Event" and if you care at all for food (preparing it, plating it, eating it) you need to get yourself a ticket (A Sunday One-Day ticket online is $25, on-site, $35). Where else and when else can you check out 13 of the best Chicagoland chefs whip up favorite items from their menus, dish out tricks of the trade, and shop around for the latest in culinary gadgets? Birch River Grill's Executive Chef John Ayaleanos is headlining the Grand Stage on Sunday November 16 at 2:30 p.m. and he's got lots of fantastic fall items on hand to cook up, including Birch River Grill's Cedar Planked Salmon with Maple Syrup Glaze and an enticing Pear and Kiln Dried Cherry Bread Pudding rinsed down with autumn spiced cider. Can't you just imagine sitting down to that meal on a chilly fall night? If you can't make it to the expo this weekend, be sure to head over to Birch River Grill in Arlington Heights (75 W Algonquin Rd, Arlington Heights; 847-427-4242) for a taste yourself. 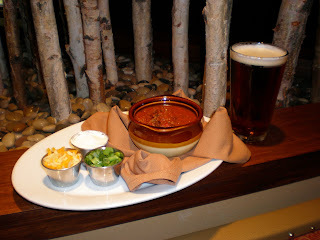 If you are thinking your thin-skin could use some serious warming up in time for winter, try out Chef Ayaleanos' Wild Game Chili, featuring Bison strip loin, Ground wild boar, Andouille sausage, Ground buffalo and of course enough spices and flavor to keep you nice and toasty. He's featured this week as the Special Guest Chef on the site, Chicago Football Chili, run by "Chili" Dan Howard. This fun site pits chili recipes, honoring the week's competing football teams, against one another; this week we've got the Chicago Bears up against Green Bay Packers so cook up a big ol' pot of Birch River Grill's Wild Game Chili, invite some friends over and catch the game.